That brings us to today’s post. In the May 15 issue of The Chicago Tribune — which I read “old school” or in print form — I was drawn to a sidebar piece that referenced public relations. The sidebar accompanied a larger story, part of the newspaper’s ongoing coverage of efforts by the billionaire Ricketts family to raise money for two iconic assets: The Chicago Cubs Major League Baseball team, and the place they play baseball, the nearly century-old Wrigley Field. 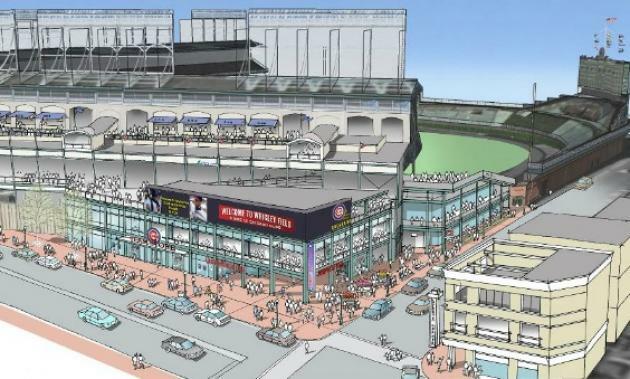 An artist’s rendering of proposed renovations to the venerable Wrigley Field. Back in 2010, the Ricketts were hoping to use state funds to help pay for $300 million in renovations to the Friendly Confines. That development sparked another so-called “public relations” effort, one The PRDude chronicled in this post. These days, the Ricketts are pushing for plans to fix up the old ballpark in large part by getting approval for much more advertising signage, a proposal that owners of nearby rooftop adult playgrounds claim is the same as a bean ball to their revenue streams. Read more in this Trib article. But it was the sidebar, the one with “PR effort” in the headline, that has prompted this discussion. The piece, written by business reporter Ameet Sachdev, states: “The Cubs have stepped up a public relations campaign to build support for Wrigley Field renovations …” The renovations are need to preserve the venerable park and modernize it. The plan includes an online petition on this web site where fans (or anyone with a computer, I guess) can endorse renovation plans that will be realized by revenue from increased signage, as well as more night games and a 6,000 square-foot video screen. The Cubs also enlisted “a consulting firm” (not identified) to conduct research from area residents to gauge their support for proposed renovations. On the surface, I applaud the Ricketts family for the petition program, for initiating a survey and for hiring communications consultants. This falls under primary research, and solid research drives all effective public relations programs — or any initiative that starts with a sound strategy. But let’s not lose sight of what’s really happening here: The Ricketts family made its fortune through smart business decisions. A crumbling ball park with outdated amenities can only attract fans — even Cub fans — for so much longer. The team is employing public relations strategies and tactics to help build awareness and acceptance for the need to get approval for its revenue-generating proposals. Do you really think they’re number 1 goal is to preserve the league’s second oldest ballpark? Or, to preserve the “Wrigley Field experience?” I think it’s to make money. There’s nothing wrong with making money. And, there’s nothing wrong with employing sound, ethical public relations practices to realize that goal.